Thank you all for following along this year on our 12 Days of BUGS-MAS adventure! We loved sharing fun bug facts with you — something so near and dear to our heart. 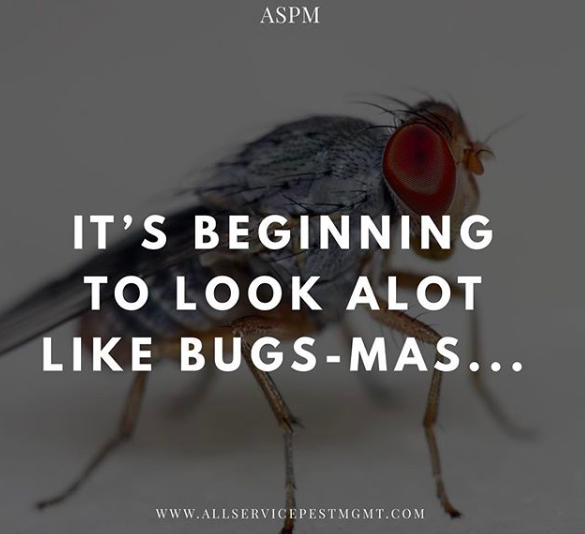 You can see all the posts and pictures on our instagram and facebook pages @allservicepestmgmt. In case you didn’t see all 12, we put them below for your reading pleasure. We would like to thank Nat Geo Kids for providing the amazing source and inspiration for our BUGS-MAS expedition. Our first feature of Bugs-Mas: the Notorious Fruit Fly!! Mr. Fruit Fly was the first living creature to be sent to space. A bee’s wings beat 190 times a second, that’s 11,400 times a minute! On the third day of Bugs-Mas we bring you the 12 Eyed Caterpillar! That’s right folks! Caterpillars have 12 eyes! Our Florida friend, the ever present Mosquito, is attracted to smelly feet! Staying on the theme of feet (though not smelly feet this time), did you know butterflies taste with their feet? The Greater Water Boatmen breathe through their bottom! Some male stoneflies do push-ups to attract a mate! Large groups of fireflies sometimes flash in unison. Did you know a lady bug might eat more than 5,000 insects in its lifetime!? A single honeybee colony can produce around 100kg of honey each year – that’s 220 jars! A mouse’s teeth grow at a rate of 0.3mm a day. Today we want to take a moment to say Merry Christmas to our beautiful SWFL community, without whom, we wouldn’t be here! You have supported small business and through your wonderful support have provided a beautiful Christmas for every ASPM family — our greatest gift is serving the community we love! Thank you all, and to all a goodnight. Thank you all again for following along! Your support and love has kept us going strong for over 20 years. Happy New Year everyone!